Dealing with occasional constipation is very low on the list of fun and enjoyable things. Dealing with chronic constipation (infrequent bowel movements over an extended period of time) is even more aggravating. The abdominal pain, the discomfort, the cramping, pinching, and feeling of being unable to let it all go… it’s pretty awful, and it impacts your daily life in countless ways. If you’ve been struggling with chronic constipation, and nothing you’ve tried so far has helped, you might have IBS-C. And if that’s what’s going on, there’s good news: The FODMAP diet can help you with this stubborn symptom. Unlike the occasional bout of constipation, IBS-C is caused by specific types of carbohydrates called FODMAPs. FODMAPs are found in a wide array of foods. For people with IBS-C, constipation is caused by the fermentation of high-FODMAP foods as they sit in the large intestine. These foods can’t be digested properly by people with IBS, and the byproduct of that fermentation is gas, among other things. This, in turn, causes the bloating, pain, and digestive slow-down. No fun. For a free cheat sheet listing high-FODMAP foods, click here. Some people with IBS are prone to constipation, while others are prone to diarrhea, in what’s called IBS-D. And some folks with IBS experience both constipation and diarrhea, at different times. It’s not entirely sure why this happens. Research is still being done! FODMAPs are the major constipation culprit if you have IBS, but other foods can also play a role if eaten in large quantities or very frequently. High Fat Meals - If you’ve spent a weekend eating fried food or lots of desserts and chocolate, you might end up constipated since fatty meals are slower to digest. Red Meat - It can be higher in fat than other proteins, but its high iron content can stop you up as well. But don’t give red meat completely--just reduce the frequency so you can still get the health benefits. Starchy, Low-Fiber Foods - Unripe bananas, white bread, and white rice can move through the digestive tract slowly. Opt for whole wheat bread and brown rice instead. Alcohol - It irritates the stomach and dehydrates you, leading to slow-moving bowels. Drink in moderation and get plenty of fluids. Constipation is a stubborn condition so often multiple strategies are needed. So, where do you start? A commonly-held belief with constipation is that it’s caused by a lack of fiber. Because of this, people often assume they need to add fiber to their diet, in the form of things like whole wheat breads and pastas, beans, fibrous veggies, and so forth. But with constipation caused by IBS-C, this actually ends up loading the system with more high-FODMAP foods, causing even more problems. Tried adding more fiber to your diet, and it hasn’t helped? You might be dealing with IBS. Increasing your FODMAP intake is going to increase the problems. Even on a low-FODMAP diet plan, getting enough fiber is important, but you have to do it safely, in line with your plan. Foods like potatoes, brown rice, quinoa, nuts, chia seeds, spinach, other greens, carrots, strawberries can be great sources of safe fiber. You can aim for 20–25 grams per day, and adjust based on how you feel. You can also take a fiber supplement, but if you have IBS, it’s important to only add the right kind of fiber to your diet. Soluble fiber attracts water, which helps with the formation of normal stools--not too loose or too hard. Insoluble fiber, on the other hand, keeps things moving through your digestive tract. Both soluble and insoluble fiber are good to add for IBS-C. For IBS-D, you should avoid the insoluble type. Soluble fiber is great because it’s gentle and works for both IBS-C and IBS-D, regulating the bowels regardless of what extreme you’re dealing with. One brand of soluble fiber I like and recommend is Heather’s Tummy Fiber. It’s been made specifically for IBS sufferers, and many of my clients love it. If you don’t have IBS, other fiber supplements made for constipation are a good option, too. Of course, there are often other reasons why people experience occasional or chronic constipation. Those can be things like food allergies and intolerances, side effects of medication, unbalanced diet, other dietary or GI conditions, surgeries, or even hydration. With any kind of constipation, it can be challenging to treat, and often done by trial and error. But if you have IBS, or suspect that it’s the source of your symptoms, then the FODMAP diet should be your first stop, because of how effective it can be at identifying those specific trigger foods. People hear the word ‘diet’ and think, ‘I’m going to be stuck eating three boring foods for the rest of my life! Maybe the symptoms are worth it, to keep enjoying the foods I love.’ I’m here to tell you that this isn’t the case! The FODMAP diet is an action plan to help you identify which specific trigger foods are worsening your symptoms, so you can avoid them. It’s a three-step plan that begins with a short period of eating a very low-FODMAP diet, for only four to six weeks. If removing FODMAPS helps you feel better, then you know you are on the right track. Next, foods are slowly reintroduced, and your symptoms are monitored. As soon as a culprit is identified, you know what it is that’s messing you up! After reintroduction and analysis, you can go on with eating a wide array of healthy foods in sensible portions, and avoiding the foods that cause you discomfort. I have a ton more information about getting started on the FODMAP diet! You can check it out here. What about some other, at-home things you can do? The use of essential oils can work wonders for constipation. Ginger, Peppermint, Fennel, Lavender, and Chamomile are some of the top choices. Osmotic laxatives such as MiraLAX are a great choice for constipation because they don’t cause harsh side effects like traditional laxatives do. They work by drawing water into the colon and softening the hard stool there, making it much easier to pass. They can be a good choice for constipation, even as a result of IBS-C, but should also be paired with dietary changes overall, to prevent the stools from getting too hard. Another option is Magnesium, which also draws water into the colon and intestines to soften the stools. Like MiraLAX, this softening allows the muscles of the digestive system to flex and move more naturally, passing the softened stool without pain or constriction. Magnesium can be added to your diet by increasing your intake of magnesium-rich foods, such as spinach, peanuts, oatmeal, potatoes, rice, and salmon. Or, you can take a Magnesium supplement; I prefer Magnesium Citrate, because of your body’s ability to absorb it easily, but other forms can work too. The Recommended Daily Allowance of magnesium—including food intake—is 420 mg for men and 320 mg for women. Osmotic laxatives (or any laxative) should be reserved for occasional use, rather than an everyday go-to. Use them when symptoms are particularly bad, or you aren’t able to stick to your normal diet (think travel, illness, or times of high stress). Constipation is frustrating, but you can make a difference with your symptoms through a few simple changes. Avoiding foods that cause constipation in the first place is key. The next step is trying additional remedies until you find the right mix that works for YOUR body. If you aren’t sure whether your chronic constipation is caused by IBS or something else, a gastroenterologist should be your first stop to uncover the source of your symptoms. If you want to know more, or if your head is spinning from a recent IBS diagnosis, then head over to my free 7-day Calm Belly Challenge. You’ll learn how to get started with the FODMAP Diet as quickly (and painlessly!) as possible. You might know about taking high-FODMAP foods out of your diet, but did you know there are strategies you can use to improve digestive health even MORE? Learn the top 5 surprising ways you can calm your belly FAST and feel better than before. It’s not just about what you can and can’t eat. That’s important, but it’s only one piece of what you need to feel better as quickly as possible. To get the best results from the FODMAP Diet, you need a well-rounded approach AND a plan to follow. If you're a vegetarian or vegan who just learned about the FODMAP Diet (the diet that shows you how to manage IBS symptoms), you might be freaking out right about now. Why? The FODMAP Diet requires that you eliminate most legumes, a huge variety of fruit and vegetables, not to mention wheat and certain nuts. So what's left for you if eating meat isn't really your style? Here's my general advice for approaching the FODMAP diet as a vegan or vegetarian: Instead of diving right in, spend a week or two learning the ins and outs of the diet. Get the Monash app (the most reliable, up-to-date reference) so you know the foods and serving sizes you should be eating. >>> IF YOU DO JUST ONE THING: Go through the app and make a list of all the foods you CAN eat and then start building your meals around those. When you're coming up with meal ideas, focus on meals you can play around with. That way, you can have a handful of different meals made with the same core ingredients to create a FODMAP meal plan that works for you. For example, if you eat quinoa or brown rice, you can combine that with your choice of low-FODMAP veggies like zucchini, tomatoes, salad greens, bell peppers, carrots, etc. You can roast, saute, or steam them. Then you can add olives, cheese, nuts, seeds, sun-dried tomatoes, tempeh, avocado, canned lentils, canned chickpeas, hot sauce if that's your thing. Just check your serving sizes, and you'll discover more variety than you think! >>> TIP: Small amounts of canned lentils and chickpeas, as well as red lentils, are low-FODMAP. Check the Monash app so you're sticking to the correct serving size (too large a serving and you cross over into the high-FODMAP range). You can eat these legumes more than once a day - just space them about 3 to 4 hours apart. Use different herbs and spices to create different flavor profiles. For example, you can have a curry bowl one day and a Mexican-style bowl (avocado, ancho chile powder, cilantro) the next day. Think about soups you can create with this method. Gluten free pasta and risotto are two more foods that can be prepared with different ingredients every time. You could probably guess this one: tofu and tempeh. Soft, firm and extra firm tofu are low-FODMAP. Silken tofu is processed differently and retains some of the liquid from the pressed soybeans where those FODMAPs are found, so avoid the silken variety. With tempeh you're in the clear. Although it's made from whole soybeans, the fermentation process reduces FODMAP content. Just be sure to check the ingredients if you're buying tempeh that's already seasoned. The best bet is to buy it plain and dress it up yourself. Tempeh contains even more protein than tofu. Tempeh has great earthy flavor on it's own, but you can dress it up any way you like. I usually cut it into cubes and sear it in a pan with with a little stir fry sauce made with tamari, lime and sugar. Finally, remember that it's temporary. You do the elimination phase to confirm your FODMAP sensitivity. Then if it does improve your symptoms, you slowly bring back high-FODMAP foods. You'll learn your tolerance levels so you can have a lot more variety and flexibility in your diet. Then check out Calm Belly Club, our online, members-only community. 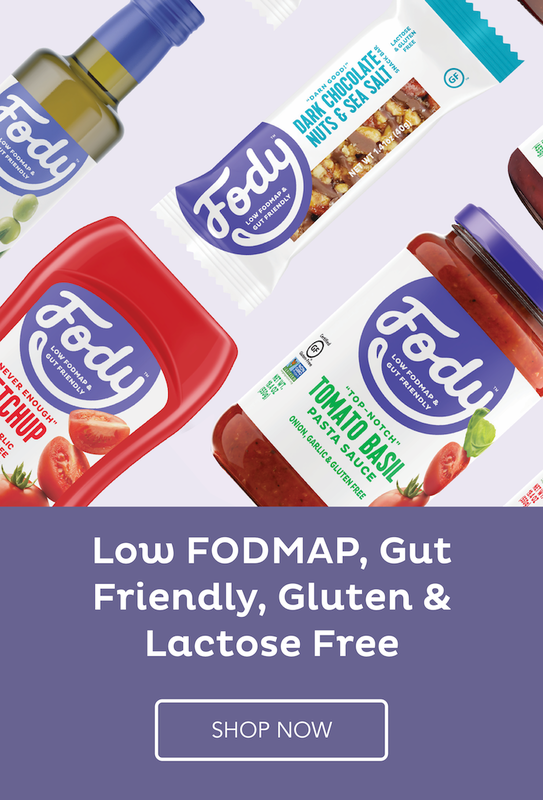 You get access to both of our comprehensive FODMAP Diet programs, including a vegetarian-friendly Quickstart Meal Guide. When it comes to managing IBS symptoms, smart eating is your first line of defense. Doing the low-FODMAP Diet is an amazing way to learn what foods trigger your symptoms AND what portion sizes keep your belly calm. Fun topics, right!? Okay, they may not be fun, but there's a lot you can do to deal with these symptoms besides just watching your intake of high-FODMAP foods. That's what I'll be covering in the series. Want to get even more support from people who know what you're going through? Click here and request to join the Calm Belly Kitchen Crew, our private Facebook group! Watch the video to go deep on this topic, or keep reading to get the main points. First thing's first: Calm Belly Kitchen is an educational resource and doesn't replace personalized medical advice. Check with a doctor before starting any new dietary treatment or supplement. Let's recap: A low-FODMAP diet can help decrease constipation a lot, but additional treatments and strategies are often needed. In my experience and in my work with clients, I've seen that learning your personal trigger foods makes a huge difference. Still most people need supporting strategies to deal with constipation. Solaray tablets and Natural Calm drink mix are two good options.